Enjoy vacationing in this exceptionally well appointed villa on the 18th hole of Crooked Oaks golf course. This villa has a beautifully updated kitchen with granite counters and a pass thru bar with 2 stools. Cooks will enjoy all the cookware and utensils for great in house meal preparation. Bead board compliments the decor along with custom window treatments and professionally appointed decor. The living area is extremely comfortable with large, plush seating. Enjoy the big game or a movie on the new 42" flat screen TV. The master bedroom features quality, new king bedding and a private bath. 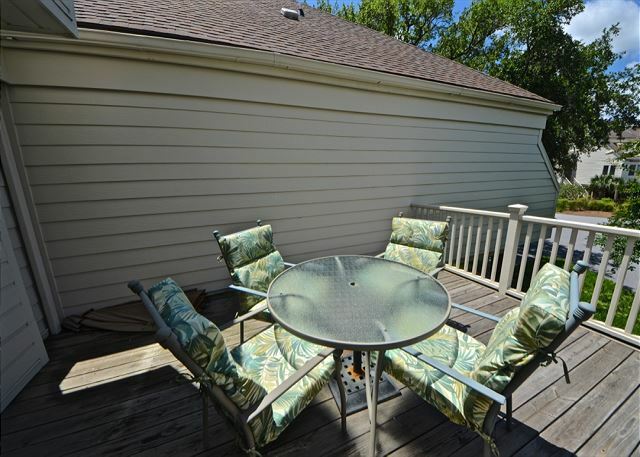 There is a cozy upper deck overlooking the golf course with expansive views and great sunlight! The first floor bedroom offers two double beds, a TV and a full bath. The villa is quite comfortable and well appointed. Relax inside and take advantage of FREE WIFI. Cook a great meal on the gas grill provided. The beach access is just across the street, a very short walk from this property and the club is also a short walk from this lovely property. We are dog friendly with an extra fee. NO landline in this villa. Cell phone use only. I stayed here previously and it was a wonderful experience. Great looking at creatures which inhabit the lagoon behind, extremely convenient to beach, and property itself is well maintained. Seabrook is a wonderful place for a family vacation. We come every Memorial week. This was our first time in this villa. Really nice kitchen. Beautiful view of golf course. Sofas are very worn out and dated. Bed downstairs has a very old mattress and was torn. Was a bit gross. Everything else was nice. This was our second time staying at this property. The view from the living/dining area is great. We enjoyed watching the birds, turtles & alligators in the canal below. Also this property is just a short walk to the beach where we saw dolphins everyday. This property is also pet friendly and we enjoyed having our small dog with us. We were able to walk to the Pelican's Nest restaurant which also has a great view. Just a short drive away is Bohicket Marina and Freshfields village where you can get a bite to eat or groceries. We'll be back! 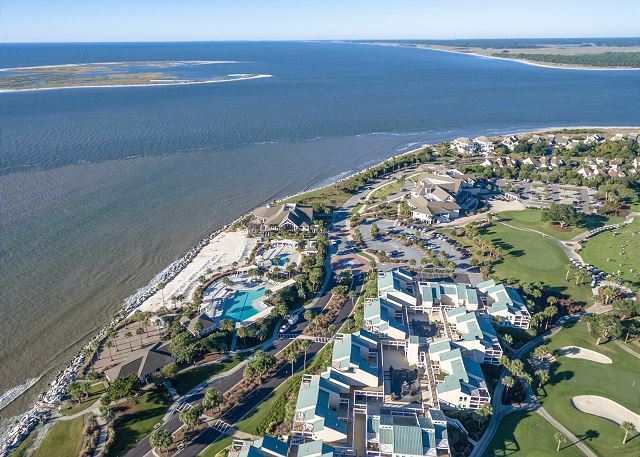 We go to Seabrook Island every year and we love this property. The view of the golf course is great and we also enjoy the canal directly below the window watching for alligators and various birds. The beds are comfortable and the kitchen stove and refrigerator have been recently updated. Other great features are the open kitchen, short walk to beach, and it's pet friendly. Enjoy! It feels like we are home when we come through the door. We visit Seabrook Island once a year and like the Spinnaker location. It's an easy 5 minute walk to the "river" beach and a short 5 minute drive to the "ocean" beach. We saw dolphins everyday and "Lt Dan" the alligator twice outside the dining room window. The management company was organized and very easy to work with. The beds were comfortable, this property was clean and the view was great. Here's why I only gave it a 4 rating - the kitchen appliances are dated - our food froze on the top shelf of the refrigerator, the dishwasher only cleans on "super scrub", and the oven is complicated to operate (even with the instructions taped to the fridge). This was our 5th year at Seabrook and our first time at Spinnaker. This unit was very clean, nicely decorated and spacious our family of three and my parents. The views of the golf course and canal was fantastic and we saw quite a few gators from the huge windows. Very close to the beach club and also has access to a short boardwalk to the beach which was great for early morning and late evening walks. The staff at Seabrook Exclusives were great to work with in planning our trip and welcomed us with a phone call when we arrived and checked in again during our stay. Would highly recommend this property! We had a great time at 741 Spinnaker. It was the perfect size for our family of five and had all the amenities we needed. The golf course view was very pleasant. We were able to get to the beach easily enough. Seabrook Island is incredibly peaceful and gorgeous. Thank you for helping us make wonderful memories with our family. Overall a great location, close walk to the beach and clubhouse. Property was nice and clean. The only downside was the mattress in the master was old and very uncomfortable, bad sleep, but I believe they are getting a new one soon. Solid place otherwise. We enjoyed our time in Seabrook Island. We are repeat visitors to this area, and really love it. We liked 741 Spinnaker. We had spent time recently in 739, and liked the layout better than 741. But - 741 was clean, nicely stocked with kitchen utensils and pots/pans. Very nice! 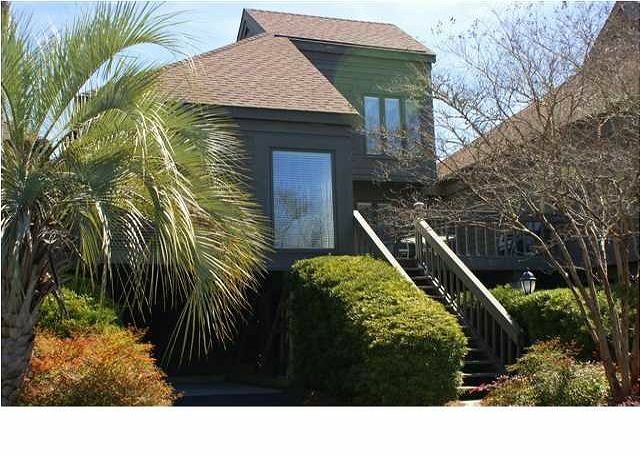 Very nice villa with all the amenities needed for a great beach week. Villa spacious and comfortable. Very easy and convenient booking and check in process. This was our second visit to Seabrook. We stayed across the street Pelican Watch previously but needed a villa that would accept pets. This unit is beautiful. I thought we would miss being on the beach but we did not at all! The view of the creek (and alligators) and the golf course was so pretty. And the beach is only a 5 minute walk away. Will definitely rent this villa again. it was our second time staying at the house and it was fantastic. see you again next year! This property met our needs beautifully. The bedroom on the first floor was perfect for my in-laws and we were able to have some privacy with the upstairs bedroom. The view of the golf course and canal was great. The beach was just out the front door and across the street which was perfect and so easily accessed. We hope to visit again soon and would stay here if it is available. The house was great, and perfect location. Walk to beach and clubhouse. We love Seabrook. Great place in a wonderful location. Kat and the gang are the most professional rental people we have ever dealt with. We were late on first half deposit and then late on second half, because we were in the process of moving, and at all times they gave gentle reminders that did not make us feel like the Beverly Hillbilly deadbeats. LOL! I cannot tell you how much that meant to us. The unit was awesome and Seabrook Island is so much fun! We will be back, and we will call you first. Have a great rest of the summer. The Spinnaker house is right on the 18th hole and is located in a quiet area on the island. The view is spectacular and the access to the ocean is right across the street. A great place to get away and relax doing whatever you like. Excellent condition with great location and view of golf course. Wish the owners would invest in good firm beds but other than that, loved it! Acquisition, attention to concerns, and efforts to accomodate requests were all exemplary. Overall, we had a wonderful week! Loved the beach, biking, Charleston and Magnolia Plantation! The house was spotlessly clean. Our little doggie loved all of the critters...deer, birds, squirrels, horses, turkeys, etc. Unfortunately, as the management company knows, there was some outside maintenance going on during half of the week, so we were unable to use the deck during those days. And I hate to mention another negative, since otherwise our stay was so great, but the master bedroom bed had little support. We are use to a temperpedic mattress and so we found the mattress there very soft. After a day of walking, a more supportive mattress would have been great. Very nice villa, close to the beach and the pool. We really enjoyed the weekend with our kids there. 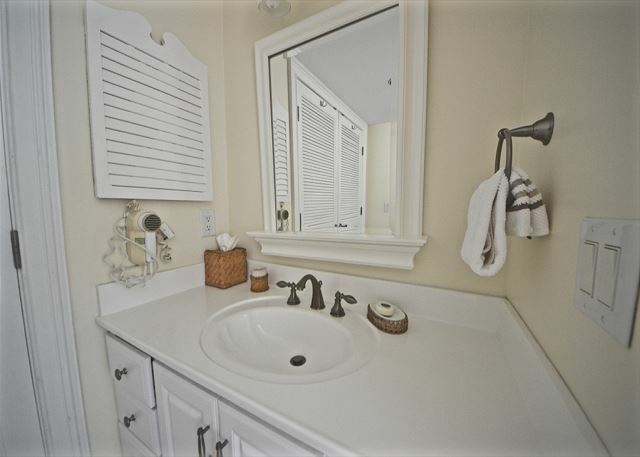 This home was very well maintained and comfortable. The only suggestion is that two lounge chairs for the deck would be nice. I had a wonderful stay at Seabrook. I have booked through the same real estate company for the past three years and they are wonderful!! I'm already planning my trip for next year. This place was really nice, the appliances were a bit older which gave us a few glitches but other than that it was great!!! I would rent this place again! Beautifully decorated. Everything looks new. Only one item that we found was that the electric plugs in both bathrooms were not functioning. Location was about 30 steps to the beach access and about 5 minute bike ride to the club house. We saw an alligator twice in the creek behind the house. Only improvement I would make is to offer a gas grill with the house rental. Seabrook Vacation and Property was Perfect! The property was beautiful, well maintained and in a perfect location. The wireless was very fast--which was a requirement since I was working some while on vacation. The beach was great and the paved bike trails over to the market were perfect. However, the best part was the ability to bring our little Sheltie with us. She loved watching the golfers. We will definitely request this property again! This is a great place that is convenient to everywhere on Seabrook. We hardly used our vehicle all week. Make sure to rent bikes.Nice view of golf course out back, and pond has nice sized gator that cruises by once or twice a day. Only a couple things were not quite right. The storm door closer didn;t work. The property managers responded immediately when called and couldn't be nicer. The front door knob would not lock, needed o use deadbolt during week. The place coud use a gas grill. It was so nice outside, it is a shame not to be able to grill steaks or burgers. Issues with tv and stove upon arrival but eventually got everything up and going. The place would have a much cleaner appearance and feel if the carpet in the main living area and dinning area were removed and replaced with hardwoods, otherwise the villa was great. Had a wonderful vacation, would have loved a screened in porch so we could have enjoyed the evenings without the bugs! We had a great stay, the weather was perfect could not have asked for a better place. Very convient to everything. The view from the living room - Dining room was GREAT !!! A very short walk to the beach just across the street. My girls took many walks which they loved. Hated to leave but we had to get back home ahead of Sandy the huricane, which we did just in time. We are looking forward to returning next year. This is our third visit to Seabrook. Every time we visit we are afraid it wont be as good as we remembered last, and every time we have been delighted to find out the magic of Seabrook is endless! The home we stayed in was absolutely perfect. The huge floor to ceiling windows offered a panoramic view of nature that was spectacular. It was like being part of a personal filming of animal planet each day with the wildlife we encountered from the comfort of our living room. We will be back again, and 741 Spinnaker will be the home we request. Absolutely fabulous!